Koh Phi Phi weather in June is the heart of low season. The first monsoon peaks at about June 15th so you can expect wind and rain. Having said that the monsoon drives in cyclones so not all days are the same and you will have some beautiful sights on a quiet yet intimate island. Koh Phi Phi weather in June is synonymous with the rain, wind but also humidity. As the sun tracks north from the equator, it goes over Koh Phi Phi and southern Thailand. This creates intense heat, and massive convection clouds systems. The rain from these 10,000m deep clouds are very powerful and a magnificent sight. There are still sunny spells during weather in June to do tours and enjoy the beaches but expect weather. The accompanying wind can be some of the islands strongest so expect waves on the ferry crossing to Koh Phi Phi Don. The westerly tracking waves are particulary confused as the bounce back off the Koh Phi Phi Don cliffs, just as you turn into the safe harbour of Tonsai Bay. The large ferries easily cope with the conditions but it still is a feisty crossing especially 'Koh Phi Phi to Phuket' or 'Krabi to Koh Phi Phi'. June is part of the low season on Phi Phi which stretches from May until October. The 2 monsoon peaks are 15th June and 15th September. The beginning of May, 10th July till 20th August and the end of October are a lot less effected by the full force of the monsoon and has surprisingly good weather. The atmosphere of Koh Phi Phi is affected by the weather in June. Less people jump on a ferry 'on-spec' island hoping if it is raining on Phuket or Krabi so the island is often at no more than 40% full. 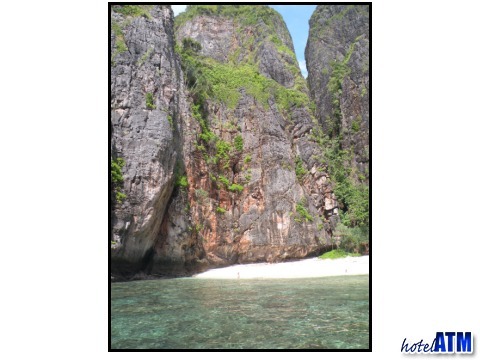 There aren’t many rooms on Koh Phi Phi don but there are many people wanting to come and see the famous sights like Maya Bay, so there is always a flow of people to the islands. When there are less people, the islanders are more friendly and the island is more like it was in the 1980s when tourism was starting. For this reason, and for many travellers, this is a great time to visit. The islands in wet season can be the best party scene. I've already mentioned that the island is more friendly and the frequent down pours pull people off the beaches under the tarpaulin covers or into the bars like Slinky Beach Bar or The Dojo have a more intimate and exciting feel. When it is raining in the morning there is nothing as satisfying as knowing that you have had a great night in the bar the night before... sleep on. Diving and tours during weather in June can be a great adventure. The dive boats will go out but will choose less exposed reefs like Pi Ley wall and Loh Samah, on Phi Phi Ley or the very close pinnacle of Hin Dot. Likewise the snorkel tours will choose their stops carefully out of the wind and waves. Hao Ragute and Runtee Bay are far more used in low season. For tours that go to Maya Bay, the customers will need to take the precarious route via Loh Samah through a rough whole in the cliff to walk to the back of the bay. Due to the weather in June and low season the island has the best prices for Hotels and Guesthouses. Prices are as much as 40% down on high season and some of the accommodation has deals that give discounts and free nights. The full list of deals by month can be found at this link. Koh Phi Phi weather in June has created a problem for the luxury 4 and 5 star Zeavola Phi Phi Resort, Holiday Inn Phi Phi Island, Phi Phi Island Village Resort And Spa and Phi Phi Island Cabana Hotel. The high end hotels need to be a lot more full than 40% to make them viable so there are great deal available. From the deal list above you will see pay 4 nights stay 5, or 20% discounts for stays over 4 nights and more. These deals come out up to a year ahead of June.